In keeping with the season of Easter (and just being lazy) I used a photo from Palm Sunday for this week’s Deck photo, I “reserved” two from that day just in case I didn’t get anything else I liked for the week, as it is I haven’t even downloaded what little else I did take, so it’s a good thing I did keep back two. This one is more in keeping with the period, and is somewhat symbolic. 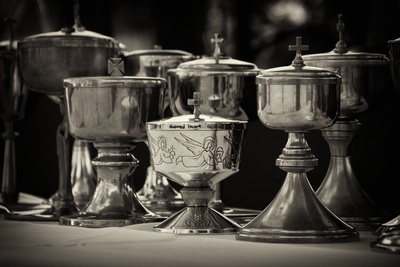 The photograph was taken early in the proceedings, the lay-ministers had just brought up all the ciboria before the altar, and I took a few snaps of them, this one happened to use as the central ciborium the one from the Sacred Heart parish. The Church of the Sacred Heart was destroyed by fire on Christmas day in 2004, the building was then 135 years old. The parishioners long to see the church rebuilt and like Christ, rise to new glory. Sunday past was the celebration of the Passion of Our Lord, Jesus Christ, also known as Passion Sunday or Palm Sunday, a remembrance of the day that Jesus entered the Holy CIty of Jerusalem, the beginning of His final days of ministry upon earth. 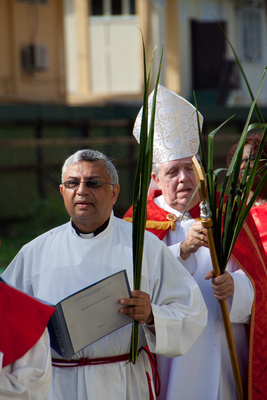 This marks the beginning of Holy Week for Roman Catholics; for the past few years the Passion Sunday celebration has been on a grander scale than that of my youth, all the Parishes of the area process to the Church of Our Lady of Fatima, and there the blessing of the Palms take place, thence the procession of all those gathered takes place into the grounds of the GCC Ground, Bourda, once famous for its Cricket matches. Click on the photograph below to go to the gallery for photos of the event.